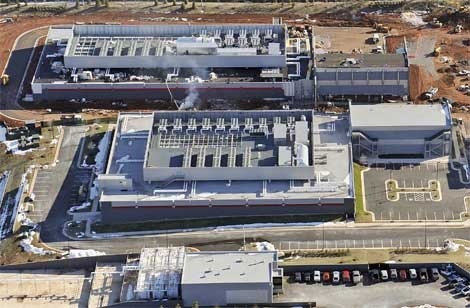 Just up the road in Culpeper, there’s a massive datacenter? That just got bigger? Culpeper’s Terremark campus just doubled in size, thanks to a recent acquisition of 27 acres adjacent to its sprawling facility â€” known as the Network Access Point of the Capital Region â€” just southeast of town on Technology Drive.The global IT infrastructure provider announced Wednesday that it spent $5 million on the deal, adding room for another 250,000 square feet of datacenter space and nearly 100,000 square feet of office space. The NAP of the Capital Region is the lynchpin of Terremark’s push to capture additional market share in the market for ultra-secure government hosting. Terremark has designed the campus to support the latest approaches to energy-efficiency and high-density computing. But security is the primary selling point for the new data center, which is optimized for government security agencies. Terremark recently unveiled a 72,000-square-foot headquarters building that features a 150-seat auditorium built to the federal government’s Physical Security Standards for Sensitive Compartmented Information Facilities (SCIF) and approximately 50,000 square feet of Class A office space that can be built to SCIF specifications in order to meet customer demands. I’m thinking of DIA and NGIC. But that’s just me. The fact that the brand-spanking-new commuter rail “actually stands a chance of turning a profit” makes this thought not entirely nutty. Now what might that do to real estate values in the Charlottesville region? Could the Charlottesville area finally see properties close to transit see accompanying increases in value? What could Albemarle do to lure such a facility here? Update 22 May 2010: Daniel wonders, How might rail shape Charlottesville? Now, actual ridership has blown these projections out of the water. Halfway through the year, the service had already exceeded both revenue and ridership goals for the whole year. As more people become aware of the new transportation option, monthly ridership growth is set to accelerate. March was the best month yet.